Inspired by an action organized by the London Guantanamo Campaign, anti-torture activists boarded BART trains on Saturday wearing the iconic orange jumpsuits and black hoods associated with detainees at Guantanamo. Somewhat ironically, the hooded prisoners read a newspaper filled with news about the prisoners' hunger strike, which after two months has finally succeeded in doing what none of us have been able to do for the last 11 years - awaken public awareness and discussion of the ethical and legal problems of holding people indefinitely with no charges. 86 of the 166 prisoners held by the US at Guantanamo have been cleared for release, but have little hope of being free. The vast majority of the others are "considered dangerous" by the Pentagon and CIA but can never be tried for any crime, either because there is no evidence against them or because what there is was obtained through torture. Transit riders were engaged by the theater, actively requesting copies of our flier. Continue reading, view more photos. Members of World Can't Wait who oppose continuing U.S. detention of prisoners at Guantanamo Bay plan to protest at the Saturday commencement address by U.S. Attorney General Eric Holder at the UC Berkeley law school. The group "World Can't Wait" was there to denounce the actions of Holder and Berkeley Law professor John Yoo. "I'm here to protest U.S. policies of torture and indefinite detention, the situation in Guantanamo," protester Henry Norr said. 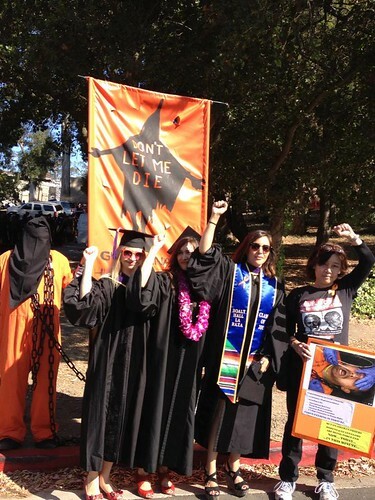 As family and friends of the graduates were arriving for the ceremony at the university's Greek Theatre, about a dozen protesters were outside, highlighting the plight of Guantanamo Bay prisoners. Some wore orange jumpsuits and black hoods. Along with closing Guantanamo, the protesters called on the university to fire John Yoo, a law school professor who advised President George W. Bush on the interrogation of terror suspects, including on the use of waterboarding. "John Yoo has no place on the faculty," said Stephanie Tang of the group The World Can't Wait. "He should be fired, barred and discarded for war crimes for what he did under the Bush-Cheney regime." Before Holder spoke, a handful of demonstrators clustered on the sidewalk with large signs, protesting the federal criminalization of marijuana, the continued detention of alleged terror suspects at Guantanamo Bay and the alleged use of torture on prisoners following the Sept. 11, 2001, terror attacks. One man in an orange prison-style jumpsuit blasted the federal government for "locking people up and throwing away the key" at Guantanamo Bay. Mary Ann Thomas of Oakland handed out orange ribbons to denote the orange jumpsuits worn by Guantanamo Bay prisoners. The protest was organized by the San Francisco chapter of The World Can’t Wait, an organization that aims to stop the use of torture around the world. Protesters wore orange jumpsuits and black hoods similar to those worn by prisoners and handed out flyers to people arriving for the ceremony. A similar protest was held at last year’s ceremony, that criticized the continued employment of law professor John Yoo, who wrote a series of controversial memos for the Bush administration that expanded the use of torture on Guantanamo detainees.